Amy Tan is known for her lyrically written (using flowing, melodic language) tales of emotional conflict between Chinese American mothers and daughters separated by generational and cultural differences. Amy Ruth Tan was born in Oakland, California, on February 19, 1952. Her father was a Chinese-born Baptist minister; her mother was the daughter of an upper-class family in Shanghai, China. Throughout much of her childhood, Tan struggled with her parent's desire to hold onto Chinese traditions and her own longings to become more Americanized (integrated with American ideals). Her parents wanted Tan to become a neurosurgeon (a doctor who performs surgery on the brain), while she wanted to become a fiction writer. While still in her teens, Tan experienced the loss of both her father and her sixteen-year-old brother to brain tumors and learned that two sisters from her mother's first marriage in China were still alive (one of several autobiographical elements she would later incorporate into her fiction). Tan majored in English at San Jose State, in California, in the early 1970s rather than fulfill her mother's expectations of becoming a surgeon. After graduate work at the University of California, Berkeley, she began a career as a technical writer (a person who writes about mechanical and computer issues). As a release from the demands of her technical writing career, she turned to fiction writing, having gained inspiration from her reading of Louise Erdrich's novel of Native American family life, Love Medicine. Despite Tan's achievements, her literary career was not planned; in fact, she first began writing fiction as a form of therapy. Considered a workaholic by her friends, Tan had been working ninety hours per week as a freelance technical writer. She became dissatisfied with her work life, however, and hoped to rid herself of her workaholic tendencies through psychological counseling. But when her therapist fell asleep several times during her counseling sessions, Tan quit and decided to cut back her working hours by jumping into jazz piano lessons and writing fiction instead. Tan's first literary efforts were stories, one of which secured her a position in the Squaw Valley Community of Writers, a fiction writers' workshop. Tan's hobby soon developed into a new career when her first novel, The Joy Luck Club, was published in 1989. Tan's The Joy Luck Club, received the Commonwealth Club gold award for fiction and the American Library Association's best book for young adults award in 1989 and stayed on the New York Times 's best-seller list for nine months. In 1993, Tan produced and coauthored the screenplay (script for a movie) for The Joy Luck Club which was made into a critically acclaimed film. It was adapted for the stage in a production directed by Tisa Chang for Pan Asian Repertory in 1999. Tan's second novel, The Kitchen God's Wife, was published in 1991 followed by the children's books The Moon Lady (1992) and The Chinese Siamese Cat (1994). The year 2001 saw the release of yet another successful novel, The Bonesetter's Daughter. Tan's The Joy Luck Club is made up of sixteen stories told by four Chinese immigrant women and their four American-born daughters, linked together by the narrative of June, whose mother had founded a women's social club in China. Nearly forty years later, June's mother has died. The surviving members, the "aunties," recruit June to replace her mother, then send her to China to meet her half-sisters and inform them of the mother's death. When June expresses doubts about her ability to execute this assignment, the older women respond with disappointment. June then realizes the women rightly suspect that she, and their own daughters, know little of the women's lives and the strength and hope they wished to give the next generation. Throughout the novel, the various mothers and daughters attempt to demonstrate their own concerns about the past and the present and about themselves and their relations. Amy Tan's novels, The Joy Luck Club and The Kitchen God's Wife, were enthusiastically received by critics as well as the book-buying public. Focusing on the lives of Chinese American women, Tan's books introduce characters who are uncertain as she once was about their Chinese background. Tan remarked in a Bestsellers interview that though she once tried to distance herself from her ethnicity, writing The Joy Luck Club helped her discover "how very Chinese I was. And how much had stayed with me that I had tried to deny." Upon The Joy Luck Club 's release, Tan quickly became known as a gifted storyteller, a reputation she upheld with the publication of The Kitchen God's Wife. Tan's The Joy Luck Club was praised as a thought-provoking, engaging novel. In Quill and Quire, Denise Chong wrote: "These moving and powerful stories share the irony, pain, and sorrow of the imperfect ways in which mothers and daughters love each other. Tan's vision is courageous and insightful." In her review for the Toronto Globe and Mail, Nancy Wigston declared that Tan's literary debut "is that rare find, a first novel that you keep thinking about, keep telling your friends about long after you've finished reading it." Some critics were particularly impressed with Tan's ear for authentic dialogue. Carolyn See, for instance, wrote in the Los Angeles Times Book Review that Tan ranks among the "magicians of language." Tan's The Kitchen God's Wife deals with a young woman in California who realizes a greater understanding of her mother's Chinese background. A generation gap exists between the two heroines: Mother Winnie has only awkwardly adapted to the relatively freewheeling ways of American—particularly Californian—life; daughter Pearl, on the other hand, is more comfortable in a world of sports and fast food than she is when listening, at least initially, to her mother's recollections of her own difficult life in China. As Winnie recounts the secrets of her past, including her mother's mysterious disappearance, her marriage to a psychotic and brutal man, the deaths of her first three children, and her journey to the United States in 1949, Pearl is able to view her mother in a new light and gathers the courage to reveal a secret of her own. Critics hailed Tan's The Kitchen God's Wife, admiring its touching and bittersweet humor. Sabine Durrant, writing in the London Times, called the book "gripping" and "enchanting," and Charles Foran, in his review for the Toronto Globe and Mail, proclaimed Tan's work "a fine novel" of "exuberant storytelling and rich drama." In a Washington Post Book World review, Wendy Law-Yone asserted that Tan exceeded the expectations raised by her first book, declaring that " The Kitchen God's Wife is bigger, bolder and, I have to say, better" than The Joy Luck Club. Tan continues to write. In 2001 her novel The Bonesetter's Daughter was released to much of the same praise as her earlier books. Bloom, Harold, ed. Amy Tan. Philadelphia: Chelsea House, 2000. Kramer, Barbara. 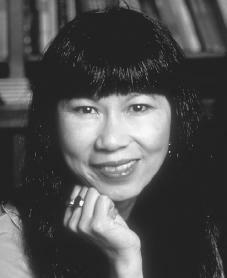 Amy Tan, Author of The Joy Luck Club. Springfield, NJ: Enslow, 1996. Shields, Charles J. Amy Tan. Philadelphia: Chelsea House, 2002. I think every human being have enouch time to suceed in whatever career he choose, sometimes we are carrying a hard bags of petition in our shoulders, father petition, brother petition, sister petition, auntie petition, but really matters, in what you really like inside of you, whats make confortable with you, your desires ocuppy the first place. I would like to become a writer, myself, took a lot of time to decide, but finally I make this decision by myself too. I preparing myself for that at the University, You make your own decision.